Nikon has unveiled its D850 flagship dSLR featuring "an unprecedented combination of extreme resolution and high speed performance," according to the company. The 45.7-megapixel sensor is Nikon's first backside illuminated dSLR sensor. "The Nikon D850 is much more than a camera," said Kosuke Kawaura, director of marketing and planning, Nikon Inc., "rather it's a statement that Nikon is continuing to listen to customer needs, to innovate for the next 100 years and bring to market a full-frame dSLR that exceeds the expectations of the professionals that rely on this caliber of camera to make a living." With the optional ES-2 Film Digitizing Adapter and compatible Micro-Nikkor lens, the camera enables super high-resolution digitizing of 35mm slides or negatives and converts them in-camera to positives. Flash sync at 1/250 sec. 5.8 x 4.9 x 3.1 in. Nikon said the D850 will ship in September for $$3,299.95. The MB-D18 Multi Power Battery Pack be $399.95, while the ES-2 film digitalizing adapter will bef $149.95. Adorama is now accepting pre-orders for the D850 body, battery pack and film digitizer. B&H is also accepting pre-orders for the D850 body and accessories. Nikon will conduct a livestream discussion for the new cameraon Aug. 29 at 6 p.m. EDT. Visit http://nikonusa.com/live to tune in. MELVILLE, N.Y. -- Nikon has announced the new Nikon D850, a powerful full-frame dSLR camera that provides professional photographers and multimedia creators with an impressive combination of resolution and high-speed performance. The 45.7-megapixel D850 is Nikon's first dSLR with an FX-format, back-side Illuminated CMOS sensor for image quality that is nothing short of majestic, allowing professionals to create stunning, high resolution still images and full-frame 4K UHD video. 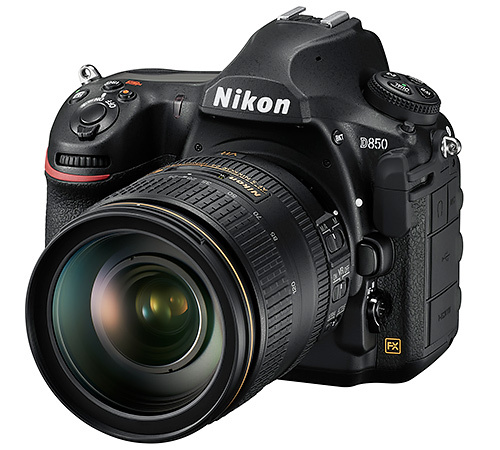 Despite its monumental resolution, the D850 is capable of an astoundingly fast capture rate of up to 7 frames-per-second (fps) or 9-fps with the optional battery grip and EN-EL18a/b battery, while offering a range of new user-friendly features requested by Nikon shooters around the world. The Nikon D850 is a serious tool that expertly enables every kind of photographer. Whether capturing for client work or personal projects, the camera delivers intense clarity and accurate skin tones for portraits, with the added benefit of low-light ability for weddings and events. It is versatile enough to be used for landscapes and fine art where broad dynamic range is critical, for sports that require a high frame rate and decisive AF or for video creators who want 4K UHD flexibility. Whether in the studio or on-location, from the catwalk or the scenic overlook, to a wedding ceremony or night sky, the Nikon D850 is the tool that can capture it all, with astounding resolution and speed. "The Nikon D850 is much more than a camera, rather it's a statement that Nikon is continuing to listen to customer needs, to innovate for the next 100 years and bring to market a full-frame dSLR that exceeds the expectations of the professionals that rely on this caliber of camera to make a living," said Kosuke Kawaura, Director of Marketing and Planning, Nikon Inc.
"I have had the pleasure of putting this camera through its paces and there is nothing like it. The Nikon D850 introduces a whole new generation of photographers to medium format quality; the resolution is out of this world and the tonality and range are at a level I never thought possible from a dSLR," said Nikon Ambassador and award-winning wedding photographer Jerry Ghionis. Flagship Focus System: The D850 uses the Nikon D5's 153-point, Multi-Cam 20K AF system, which features 99 cross type sensors, 15 of which are sensitive to f8. EXPEED 5: Behind every great sensor is a great image-processing engine. EXPEED 5 is Nikon's most powerful engine yet, allowing for fast data readout and swift image processing, improved low light performance, high speed shooting, full-frame 4K UHD video capture and greater power efficiency for longer battery life. Tilting LCD Touchscreen: The 3.2-in., high resolution (2359k-dot) LCD monitor offers Nikon's most extensive touch functionality ever. Silent Shooter: The D850 offers the ability to operate with an electronic shutter in Live View. When in this mode, users can shoot in complete silence, which is ideal for weddings, ceremonies and events where the shutter sound is discouraged. The electronic shutter operates at up to 6 fps (AF/AE locked) at full resolution, while an additional mode enables 8.6-Mp capture in DX image area mode at up to 30 fps. Nikon's Widest and Brightest Optical viewfinder: The 0.75x viewfinder magnification is the highest ever for a Nikon dSLR and offers a wide and bright view of the frame to easily track and compose subjects. Negative/Positive Scanning: With the optional ES-2 Film Digitizing Adapter and compatible Micro-Nikkor lens, the camera enables super high-resolution digitizing of 35mm slides or negatives and converts them in-camera to positives. Square shooter: Photographers can choose from five formats, including FX-format, 1.2x, DX, 5:4 or 1:1 square with viewfinder shading for easy composition. Built-in WiFi & Bluetooth Connectivity: Users can seamlessly send images to their compatible smart devices through an always-on Bluetooth Low Energy connection or through WiFi. Nikon SnapBridge also gives the ability for remote capture and preview. Full-frame 4K UHD at 24/30 fps: The D850's FX BSI CMOS sensor allows 4K UHD output at a full-frame width at 16:9, to increase lensing options and provide a true field of view. 8K/4K Time-lapse: Users can create 4K UHD time-lapse videos easily in-camera or can use the built in intervalometer to capture images for an ultra-high resolution 8K time lapse that can be assembled in post for those who want the ultimate in video quality. Zebra stripes: The D850's highlight display mode uses zebra patterns to quickly spot overblown highlights. What's more, the zebra patterns come in two varieties, selectable according to the patterns and textures of the subjects. The amazing performance and image quality of the Nikon D850 is best coupled with the wide variety of Nikkor lenses, heralded for their unmatched image quality, color reproduction and optical characteristics. For maximum fidelity, Nikon's Gold Ring Series of lenses provide the highest caliber of optical performance needed for such immense resolution applications. The Nikon D850 will have a suggested retail price of $3,299.95 and will be available in September. The MB-D18 Multi Power Battery Pack will have an SRP of $399.95, while the ES-2 film digitalizing adapter will have an SRP of $149.95. For more information on the latest Nikon products, visit http://www.nikonusa.com.